Daisy the Curly Cat: Wordless Wednesday: Gulp! I fink your Wordless Wednesday photo explains why I can't do what Dizzy's doing in mine... Waaaa! Why can't I eat and eat and not get a bigger bottom? Super photo Daisy. I can't believe all of them are for you!!! My goodness, what a lot of Temptations! I think you must have gotten that bigger allowance that you were wanting in your Sunday comic. Yum! You look ready to chow down! WOWWY WOWWY WOW! Look at alla them treats you is gittin'! Dang...is there any chance your mommy might want to adopt 12 very abused and mistreated cats?? ?...we never git that many treats. You must be very loved and treated right, Daisy! Wow. Standing on glass???? My crew would never do that. Those treats must be excellent. Right now my two kitties are drooling when looking at the computer and then turning their heads to look at me with their best "stink eye" because they never get that many treats. Hooray for treatys! We really love your pudgy little pooch, Daisy dear! Your Mom catches you in the most unique poses! The most interesting part is your belly~!!! How could you keeping eating also tight your tummy~!? You are very good! This has got to be a glass tabletop, right? Excellent!! Happy W W, mine's up...a love interest today. Hope you can stop by. AHHHHHHHH!!!! hahahahahahahaha! great pikshur, but you scairt me a little bit there for a second. Another one that would make a good lolcat. Excellent shot! what a cool photo daisy!!! Oh my! Amazing picture, Daisy! Daisy, you must spend a lot of time looking down at your mom's face from on top of a glass table. With a camera too. You know that camera isn't part of her face right? Super nice shot. You took that from the bottom, right? Wow! Daisy were we allowed to do Wordy? It was meant to be wordless, but there were words... No one has to read them! Do you want to come lick our fish?? That is an absolutely awesome photo Daisy ... wonderful perspective! Not to mention a great pile of goodies! Love that picture! Your tummy is quite flabby huh? No offense dear! Just telling the truth. Hee! We was a little scairt at first Daisy until we realized you're on a glass table! Those treats look so yummy! WOW! You certainly has a mouth full. I am's impressed!! That's alots of treats. i hope those are going in and not coming out. Oh my that's a good shot of you eating your treats. I see nothing disturbs you from your treats - not even a clicky thing. That is a super cool picture. Are those all temptations? Because I love temptations. They are super delicious. PS - How do you get those tasty morsels off the table without leaving nose prints or drool? You are very, very talented. Wow Daisy!! Such a cool picture. Your mommie is a great photographer. And you are a great model, of course! Love the angle - too funny! Your Mom had a great idea! Such a photograph is taken truly, how, it is great mommie!! Being able to look at the reverse side of the daisy, it is delightful! That is cool! I can see the food in your mouth! I'm showing this to Steve. I NEVER have seen so many treats in my life. He has obviously fallen down on the job. BTW, your mother takes the best pictures. I am wordless Miss Daisy, and your mommie is very creative. Dennis has never eaten any dry food. Ched eats it, but Dennis refuses. nice soft mole is more Dennis-style, or a plate of chicken. Dennis likes the creativity of this picture though--Daisy always looks good! I LOVE that photo, Daisy! And thank you for wishing my Grandma & Grandpa a Happy Anniversary. I gotta say...your mommy is super talented at getting interesting shots of you. I love it! Oh what a nice pile of treats you have! That's a great pickture, Daisy. You look very hungry. Your mom even got the picture with one in your mouth! Cool pic. 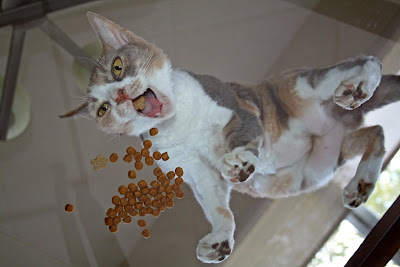 Looks like you're on a glass table with your treats? We are furry impressed you can eat your fuds in mid air! Great picture Daisy! My mom loves your tummy! just what kind of treats are those? I'm not allowed on the glass table. I'm so jealous!! You get that many treats at one sitting???? LUCKY! You must have been a very good girl! And I can't get the picture of your mommie crawling under the glass table to get this shot outta my mind now! Nice picture! Looked at first like Weightless Wednesday. Foods! Nom nom nom nom!! Great picture! You must have been very good. What kinda treats is dem? Yoo were planning on chewing dat one in yoo mouf afore yoo swallowed, right? We neffur sawed "eating" from dis angle afore...intristing. How'd yoo keep from leaving drool all over da glass? i luv doze "frumunderdatabul" shotz! i am laffin an laffin. dat d-o-g daisy iz on mi blog today. thankz fer da camera info. I see your cute little feets, Daisy! great photo,i thought at first she was diving after those yummies. You must have been vewy vewy good! OH. MY. CAT. Whut a tummy shot. Can sumbuddy git me a paper bag to breethe into??? Don't eat to much Daisy, don't want a tummy ache. Happy WW! What a fabulous WW photo! Looks like you ate on of the treats first. I would have too! Nice picture. Oh my! Skeez is hyperventilating over that view of your soft belly. P.. - Maybe Pixie would snuggle wif you more if you smeared bananer oil on yerself! I SEE LUNDUN I SEE FRANSE I SEE DAISY'S NOT WARING ANY UNDERPANTS!!!! HAHAHAHAHAHAAHAHAHA! What a great idea for a picture and what a beautiful kitty! Wow! You got to eat all of them!? We only get 3 or 4 at a time. Mom!!! Great tummy shot Daisy. :) Your mommie is so creative! Hope you're having a great day. Should that be "up the hatch" instead? You look like you're standing on air, Daisy! That's quite a feat! My WW is also a kitty cat! Hahahahahah - glass tables make for some awesome pictures! Daisy, wow, we knew you could fly...but this picture is amazing!!! That is one cool picture Daisy! What a fun photo! Great perspective. Very cute! That's a lot of treats Daisy, and a great shot. We wuz wondering....does your mum often lay unner the table? Ha ha ha. That is a great photo, Daisy. It fooled mom for a minute. Yummy! Food is one of life's greatest pleasures. What a great angel! I love photographs when taken from unusual views. I just love cats especially the fluffy ones. Hahahahahha, mom laughed out loud at that photo. Daisy is so cute! Nom, nom, nom! You are very lucky to get al those treats!!! I love this picture! It's my new desktop wallpaper! Now I can look at your cute widdle belly all the time! You mama did a great job with this creative shot! Whoa! That's, like, a picture from a special-effects movie, Daisy! That blows my mind. We would get a photo like that, but we cant get the kitchen floor to go clear! Howd you DO that? You've hit the jackpot for sure, Miss Daisy! My, what sharp teeth you have! Holy Gwauack-a molly! You looks so fiercee abouts your kibbullz! I wouldz not want to takes doze away from you! Tat is one of my favorite photos you have ever done. Fabulous! How many shots did it take to get that just right?! Well done (to both photographer and model). Daisy - what happened to your food bowl. Of course it wouldn't be nearly as interesting a picture if your bowl was blocking your food. We love the treat in your mouth. That's the way we look right before we yak. Whoa!! What a nice treat from your human parents! That picture is HILARIOUS!! What a great angle. This totally cracked me up! checks out my blog but its really cool so just click my name and u will c my blog thank u so much u rock!!! You must have been a good girl Daisy!! That is an awful lot of Temptations! We love that picture! I love this picture the most. Mom likes the tin-foil hat one the most.